Blue Mist is a shrub or a treelet, about 4 m tall. Leaves are simple, opposite, decussate; lamina narrow linear-elliptic to linear-lanceolate; tip pointed, base narrowed, with entire margin. 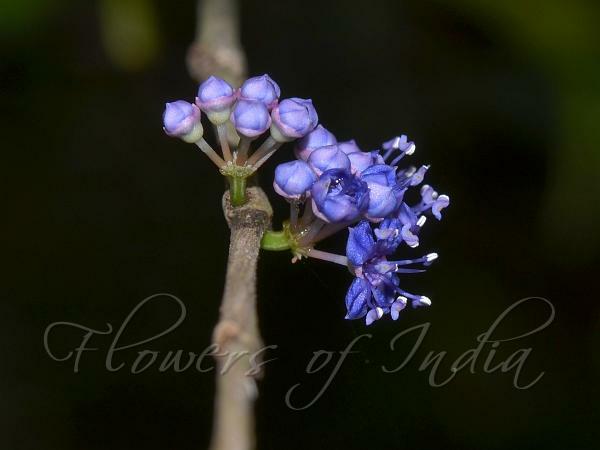 Flowers are blue in color and are borne in umbels in leaf axils. Inflorescences are thyrse-shaped to umbel-shaped, many-flowered, 1-2 cm across, stalkless or with up to 1 cm long primary axes at the nodes on the branches below the leaves. Flower-stalks are 1-3 times the calyx length. Calyx 2-3.4 mm wide, smooth or shallowly striped inside, flat or shallowly 4-lobed. Petals widely elliptic-ovate, blue. Anthers 1.3-1.6 mm long; connective with a gland. Fruit is a blackish pruple, one-seeded berry. 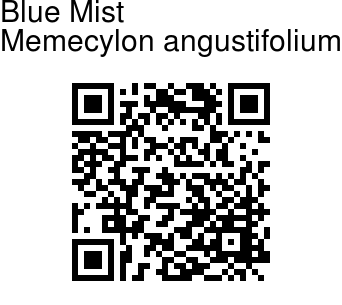 Blue Mist is native to India and Sri Lanka. Flowering: April-May. Identification credit: Anurag Sharma Photographed in Hebri, Karnataka.